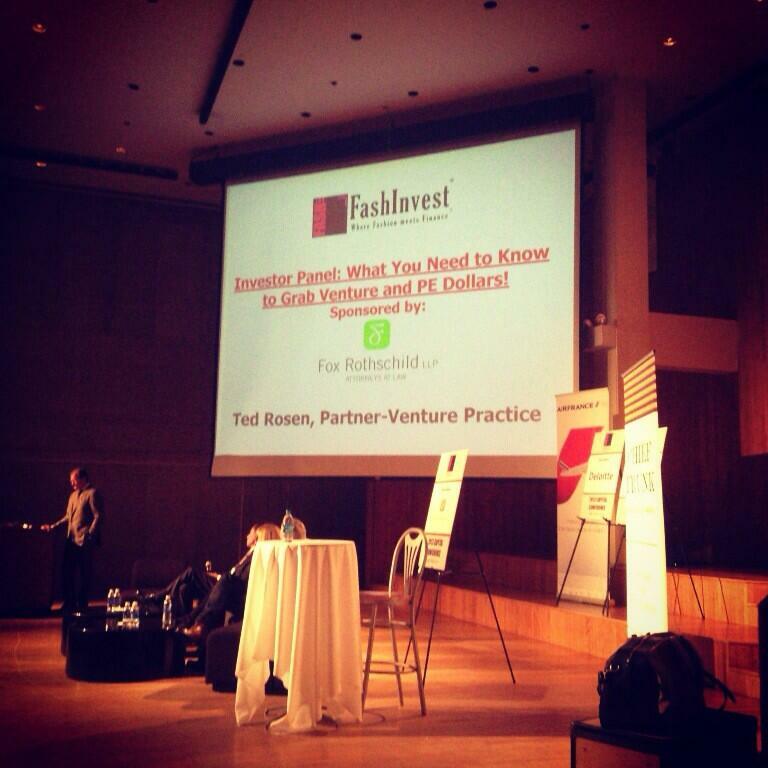 FashInvest‘s fourth Capital Conference proved to be a can’t-miss event and clearly showed NYC’s growing commitment to Fashion Tech. Creator and co-founder David J. Freschman‘s bold, focused vision to create a framed space for where “Fashion meets Finance” has become a staple in one of the leading global fashion capitals of the world, as we witnessed the ever-evolving convergence of fashion, art, and technology. Startups pitched. Veterans shared their VC war stories and everyone networked. With over $1B being poured into hundreds of Fashion Tech companies, perhaps First Mark Capital’s Lawrence Lenihan, addressed the opportunities and style stigma best when he posed the question: can investing in fashion come without the “fashion risk?” (His nutshell methodology is pretty safe: empower traction for (multi-category) growth only; don’t bet on personal taste). “If you are a serial veteran seeing a great concept in action, move fast, assuming there are others out there doing it,” she said. “True vets can go with their gut. Testing is for sissies.” Indeed it has worked for her: she has a $100M run-rate and is en route to growing internationally, expanding with Christie’s-eque collectors’ art and, potentially men’s timepieces, toward $1B. “Get amazing content first, before the tech (she considers TRR is 6/10 with tech, with room to improve),” she noted. “Get key, real product before building demand. Keep consistently balancing marketplace dynamics between the two.” That was the recipe for getting to $5-$10M, with some refining of and adjusting the model daily. Regrettably, most often there is no substitute for the relentless time-in, rewards-out model. She has been at it five days a week, with 16 hours, and two day, putting in 4-5 hours weekly, with no big changes in that schedule in sight. The blueprint to scaling even bigger was more involved, including factoring in an adequate number of buyers available to scout product and growing a sales force. The Real Real is 180+ employees strong, with buyer scouts governed by detailed performance quotas. Copycats have come and gone, but even with their sharper tech platforms, their poor, inconsistent products couldn’t compete with the heavily discounted, gently worn Chanela and Balenciagas the Real Real offers.. Speaking of dog food, yes, Wainwright is the former CEO of the now-defunct pets.com. The Alumni and VC panels gave a nice range of working insights, while the young alumni focused on the key tenets of entrepreneurship that most of us can recite by heart: big idea, great market opportunity, focused target market, profitable business model(s), knowledge of value affecting big market, clear and comprehensive execution strategy, and team building. Nuances of when to and not to bootstrap, instilling investor urgency, and generating general interest were all explored and discussed. VC thought leaders followed.. Fashion e-commerce is naturally of interest to this group, as the VC world is predominantly tech-oriented, focused and motivated. Again, venture capital runs from risk, and fashion design lines and retail stores need big stakers. The conclusion: a lot comes down to brand and proof of concept. “A brand is your relationship with the consumer/customer. Has the market proven you can exist?” challenged Lenihan. “If so, defining brand is building how to connect with the customer…what they think about and feel when they hear your name with their eyes closed.” It was acknowledged that the two-headed beast (creative and business-minded partner co-founders) are often needed to bring the magical mix needed that creatives alone are often lacking. What’s NYC without a touch of show biz? Another FashInvest staple, well-known Style Shark, Daymond John, took to the stage to MC the fashion tech start-up pitch presentations. He has co-hosted style start-ups panels at each of the FashInvest Capital Conferences since its inception, balancing neutrality, wit and charm with thoughtful entrepreneurship questions. Founder Allison Dorst pitched Pinks and Greens as a much-needed destination for stylish women’s golf, tennis, and fitness apparel. The premise was clear and promising: the women’s active style market is $35B, but bricks-and-mortar and online retailers largely focusing on men and equipment, with fashion as an afterthought. Aimee Cheshire’s Madison Plus Select targets the curated online retail for 10+ size fashion. Dawn Dickson of Flat Out of Heels also did a promising presentation, conceding that women love high heels, but could and should carry her durable, red-soled flats with them for their interim lifestyle. Taking the brand to a movement, she aims to carefully place vending machines at high-trafficked venues to help solve women’s pain-points (literally) at the point of need, while otherwise marketing the brand and products. With a mix of realistic sales projections and co-opted LCD venue advertising, she projects that the machines will quickly pay for themselves. United By Blue was an interesting direct-to-consumer men’s apparel and accessories line, proudly pioneering the responsible fashion movement, with part of their proceeds going to water clean-up. Brian Linton showed a clear actual and projected environmental impact that the company is having. No matter the target market, one thing was clear: fashion just never seems to go out of style.